Abandoned vehicles litter Anchorage streets. Authorities want to change the law and tow more of them. 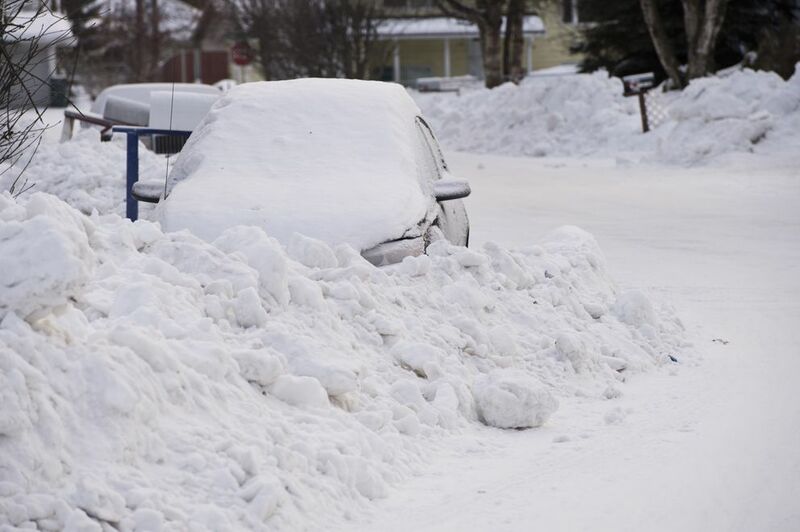 Anchorage officials want to step up efforts to clear streets of what police say are hundreds of junk or abandoned vehicles blocking snowplows, draining police resources and irritating neighbors. The administration of Mayor Ethan Berkowitz plans to ask voters in April to change the Anchorage charter, which is like the city’s constitution, to restore the ability of code enforcement officers to ticket and tow junk or abandoned vehicles. For years, that job has been essentially restricted to Anchorage Police Department employees, which officials say isn’t efficient. “We’re taking very expensive police officers, who should be fighting crime, and putting them on low-priority calls,” said City Manager Bill Falsey. The problem of junk cars “impacts snow removal operations and it’s just sort of urban blight, and stuff people don’t want in their neighborhoods,” he added. The situation emerged as an unintended consequence of a 1997 charter change, Falsey said. The proposed ballot measure would free up officers for more serious crimes or neighborhood policing, city and police officials say. City code enforcement officers already regularly encounter abandoned vehicles, Falsey said. Junk or abandoned vehicles are often simply eyesores as well as public safety hazards, he said. Sometimes the vehicles are tied to crime; others are symptoms of a life in flux or financial trouble. Anchorage police consistently ticket and tow between 600 and 700 vehicles each year, said Lt. Richard Henning, who oversees the traffic division at APD. The tally reached more than 760 vehicles in 2018. A significant backlog built up in the fall of 2018 when an earlier towing contract ended. City officials spent the next few months finding a new contractor. On Dec. 27, Alaska Towing & Wrecking began an $845,100 contract with the city, according to a copy of the contract. The contract runs until November 2019. 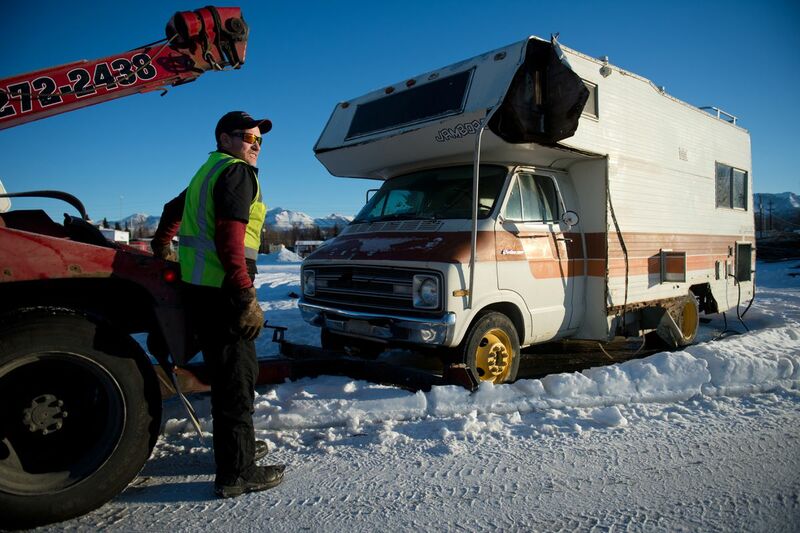 In the first 10 days alone, crews towed 90 junk or abandoned vehicles, said Glen Bailey, the president of Alaska Towing & Wrecking. The tally included a half-dozen motorhomes. Between five and 10 requests come in each day for tows, Bailey said. He said he once got a list with 40 vehicles on it. He guessed it will take months to catch up on the backlog, and police estimate there are hundreds more junk or abandoned cars scattered throughout Anchorage. “They’re all over the city,” Bailey said. He said he’s had to find more space to fit all of them. If a vehicle isn’t retrieved after about six weeks from the impound yard, Bailey’s company will crush it. The Berkowitz administration has also made fighting blight a priority, such as pushing to clean up vacant or abandoned homes, Falsey said. Back in 1997, amid an outcry over what was seen as overly aggressive parking enforcement in downtown Anchorage by the then-Anchorage Parking Authority, voters restricted ticketing and towing to APD. Two Anchorage sisters fueled the campaign by dressing up as “parking fairies” and putting money in meters. Today, an entity called EasyPark writes parking tickets and impounds cars downtown. Parking violations everywhere else in the city have to be enforced by a uniformed APD officer or a department employee. Community service officers, APD employees who are sworn officers but don’t carry a gun or a badge, are often the ones who go check on abandoned vehicle reports, Henning said. But an effect of the 1997 vote was that it halted code enforcement officers from being able to tag and tow vehicles, said Frost, the city code enforcement chief. Code enforcement officers routinely encounter junk or abandoned cars during the snowplow and summer maintenance seasons, Frost said. He said his crews can only place informational tags on cars and wait for police to show up. City ombudsman Darrel Hess said he and other elected officials get calls constantly to complain about junk or abandoned vehicles being dumped in neighborhoods. In many cases, it takes weeks to remove a vehicle because police have other priorities, Hess said. He said he helped push for the legal change to expand enforcement authority. “It’s a significant quality-of-life issue for a lot of neighborhoods and a lot of people,” Hess said. In 2018, voters also allowed Girdwood to use a different police department -- the Whittier Police Department -- to enforce parking problems during big events like Slush Cup or Forest Fair. Henning said it makes a lot of sense to team up with Anchorage code enforcement and right-of-way officers. “I would much rather have (APD) officers doing preventative patrol,” Henning said. Sgt. Jeremy Conkling, the president of the Anchorage Police Department Employees Association, sent a letter to Berkowitz calling junk and abandoned vehicles a “drain” on APD. Current Anchorage law says cars can't be left on city streets for more than 24 hours on weekdays. Police have used a mix of chalk, photos and rocks left on wheels to track whether a car has been moved. The city has been dinged within the past few years, however, for the vagueness of the laws around abandoned vehicles. The law doesn’t spell out how far a car owner has to move a vehicle to keep it safe from towing, or what exactly it means to leave a vehicle “unattended” for a certain stretch of time, the Anchorage ombudsman’s office wrote in a 2017 report. The report decided the city had improperly towed and crushed a man’s 1970s-era bus few years earlier. An investigation found police did not have enough evidence to prove the bus was abandoned. Police had grown frustrated with the bus owner for only moving it a few feet after being warned, but the law didn’t say how far it had to be moved, the ombudsman report said. The city ended up paying the man close to $20,000 in compensation. Hess, the chief ombudsman, worried the city’s policies could disproportionately affect lower-income residents who couldn’t afford to pay to get buses out of storage. But Hess also said that in the majority of cases, it’s obvious the car has been abandoned. Police should take more care when the cars have valid tags, Hess said. Records show the law still hasn’t been updated, though Hess acknowledged that rewriting it could be tricky. The proposed charter change only affects junk or abandoned vehicles, according to the text of the measure. It will not change the way other traffic or parking laws are enforced. Officials also predicted the change would bring in more revenue to the city through Alaska Permanent Fund garnishments and the recovery of fines and towing fees. A big question is how to change behavior so people don’t abandon cars in the first place, Henning said. In some cases, people appear to be buying run-down cars on Craigslist and driving them until they break down but can’t afford to fix them, Falsey said. There are options for people who own junk vehicles that they can’t maintain or sell, Henning said. There are also a number of vehicle donation programs, through organizations like the Salvation Army of Alaska and the Make-a-Wish Foundation. A list can be found on the Alaska 211 website. The Berkowitz administration needs eight Assembly votes to put the measure on the ballot. A majority of Anchorage voters would then have to pass it in the city election on April 2.